A 77-year-old woman with a history of hypertension, hypothyroidism and leg edema presents with increasing fatigue and dyspnea. An echocardiogram done two years ago demonstrated a left ventricular ejection fraction (LVEF) of 60% with diastolic dysfunction. An electrocardiogram (ECG) is performed (Figure 1). A. Left anterior fascicular block. C. Anterior wall infarction of undetermined age. D. Right ventricular (RV) strain. The correct answer is: D. Right ventricular (RV) strain. The QRS axis is borderline leftward (approximately 5-10 degrees); therefore, left anterior fascicular block is incorrect. The asymmetric T wave inversion in V1-V3 are classic for RV strain and offer a valuable learning point as these are often mistaken as ischemic changes; therefore anterior ischemia is an incorrect choice. A 2-D echocardiogram showed a moderate right atrial enlargement with severe pulmonary hypertension. The RV pressure was estimated at 92 mm Hg. 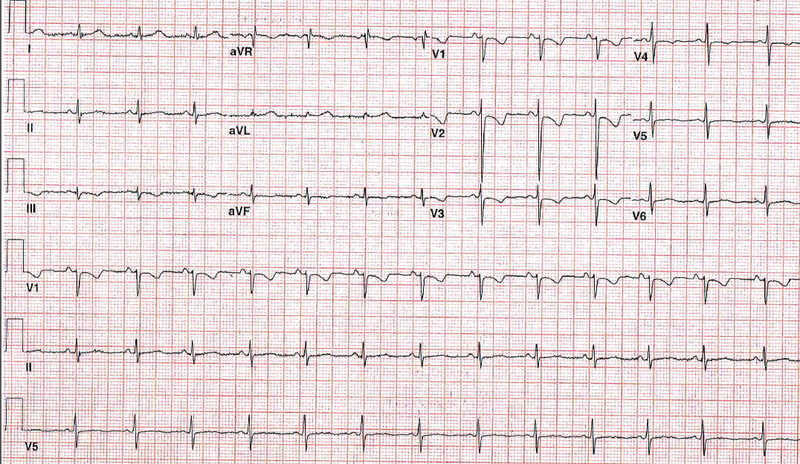 Although poor R wave progression with prominent S wave in V4-V5 suggests right ventricular hypertrophy (RVH), however, the other specific criteria of RVH (see below) are not present in this ECG. Therefore, the correct answer is RV strain. Nikus K, Pérez-Riera AR, Konttila K, Barbosa-Barros R. Electrocardiographic recognition of right ventricular hypertrophy. J Electrocardiol 2018;51:46-9. Meng FC, Lin YP, Su FY, Yu YS, Lin GM. Association between electrocardiographic and echocardiographic right ventricular hypertrophy in a military cohort in Taiwan: The CHIEF study: ECG criteria for RVH. Indian Heart J 2017;69:331-3.